It took me over a year of chipping away at this book to finally finish . Having spent the the past 7-8 years reading this series now I need to get through to the end. I would have to say that I do enjoy this series on the whole, but this book is the prime example of what is wrong with the series. This book clocks in at over eight hundred pages. We are 90% of our way through this series and Erickson continues to layer on an endless number of new characters and story arcs. The book's structure is also quintessential of the series thus far, where the reader is dragged along for hundreds of pages with little concrete happening in terms of the story, only for a very impressive climax to finally occur in the last 150 pages or so. This book did have a fantastic ending battle, of which Erikson is known for, and I found myself emotionally distraught as we once again watched characters we came to love and enjoy get torn apart by the horrors of war. 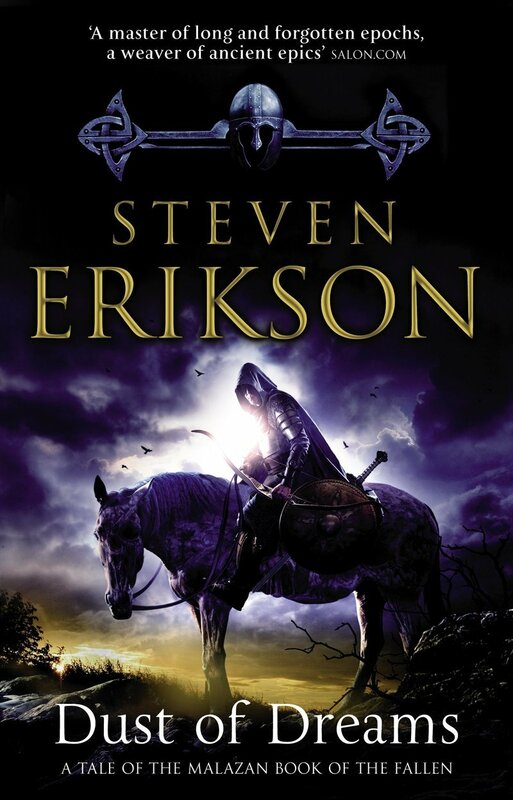 Truthfully, I don't know of many authors who can write large battle scenes as well as Erickson can. The difference for me this time around though is that the final battle felt a bit too "Deus Ex Machina". The enemy that our main characters encountered came from nowhere, and I did not have any pretense, as a reader, as to where they came from, why they were there or why they were attacking the Bonehunters. Because of this the weight of the scene was largely lost. To add to that whole feeling of "huh? ", was the fact that Erikson threw another "Deus Ex Machina" element into the final scenes during a battle with the sky keeps. When we thought our heroe to be lost, a new player enters the field, seemingly out of nowhere. It all felt just a bit too convenient of a story telling mechanism for me with out the necessary guiding motivation for it to actually occur.